Tsunami damage in Kessennuma, Miyagi prefecture on March 20, 2011. 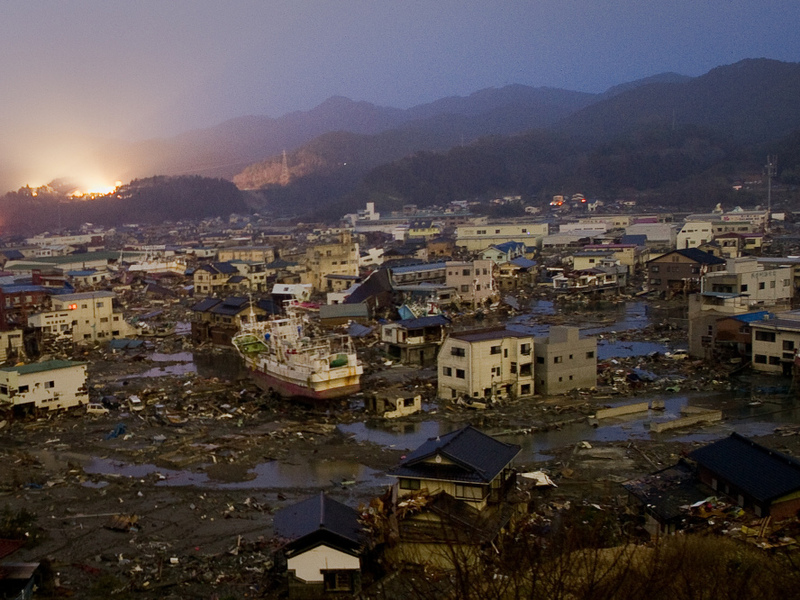 We're following developments with the nuclear, earthquake and tsunami disaster in Japan. This post will automatically refresh every 30 minutes or get updated when there's new information. Update at 6:46 p.m. ET: We're going to pause our live blog here. We'll be back tomorrow morning with the latest. Until then, check out the rest of NPR's Japan crisis coverage on our Japan news hub. Among the items you'll find there is a regularly updated gallery of photos from Japan. Taylor Anderson, 24, of Midlothian, Va., died in the disaster, the Richmond Times-Dispatch reports. She was in Japan on a teaching program. MSNBC says Anderson appears to be the first known American casualty. Kyodo News writes that "the total number of people killed or reported missing as a result of the March 11 earthquake and tsunami that hit northeastern Japan stood at 21,459 as of 9 p.m. Monday, the National Police Agency said." Of that total, 8,805 are confirmed as dead, the news service says. Update at 12:50 p.m. ET. Quote Of The Day? "I would say optimistically that things appear to be on the verge of stabilizing." The world's most famous investor, Warren Buffett, said today that the crisis in Japan "is a buying opportunity and he won't sell his shares in the country as its future hasn't been changed," Bloomberg News reports. Update at 11:05 a.m. ET: Japan Nuclear Situation Improving: Bill Borchardt of the Nuclear Regulatory Commission says Fukushima Dai-Ichi Reactors One, Two and Three 'appear to be functional' although they've taken core damage. He says spent nuclear fuel cooling ponds at Reactors Three and Four are stabilizing, according to Bloomberg. There was smoke or steam over the complex earlier today, but ABC News cites Borchardt, who says there's been no sign of increased radiation. Update at 10:20 a.m. ET: Higher Demand For Japanese-built Vehicles? USA Today suggests consumers are flocking to fuel-efficient vehicles made in Japan, such as Toyota's Prius and Honda Fit, possibly signaling short supplies in the future. Update at 10:10 a.m. ET: Status Of Japanese Automakers: Japanese automaker Nissan is resuming some parts production nearly all its Japanese plants, and vehicle production will resume later this week. Honda had already idled plants before the quake struck, so the automaker lengthened the suspension through Wednesday and will reassess then. Toyota says the disaster had a limited effect on its North American operation because many vehicles and parts are made here. Toyota is cutting back on overtime to ensure there's an adequate supply of parts from Japan. Update at 9:45 a.m. ET: Damage Estimate: The World Bank predicts Japan's financial damage will be temporary, until rebuilding efforts gain steam later this year. The Washington Post picks up on the agency's damage cost estimate: $235 billion, eclipsing costs for last year's quake in Haiti or Hurricane Katrina in 2005. Update at 9:20 a.m. ET: Aftershocks Continue: There've been at least four aftershocks with magnitudes of 5.0 or higher near Japan today, according to the USGS. The strongest tremor in the past three days occurred Saturday evening off Honshu island; its magnitude was 6.1. "...the current international emergency response framework needs to be reassessed...the Agency's role in nuclear safety may need to be re-examined, along with the role of our Safety Standards. It is already clear that arrangements for putting international nuclear experts in touch with each other quickly during a crisis need to be improved." Gray smoke is billowing from the stricken Fukushima Dai-Ichi nuclear complex. Kyodo News says smoke tapered off at reactor Three, where an explosion damaged the building last week. Now, new smoke is blowing out of reactor Two, where officials believe there was a separate building blast last week. Here is the status report of all the nuclear reactors. The Japan Times reports the number of dead from the quake and tsunami is 8,649. The number of missing people has risen to 13,262. There are about 350,000 in hundreds of emergency shelters. Governors in several prefectures were ordered to halt shipments of spinach after testers detected radiation levels that were higher than the legal limit. The Wall Street Journal says Japan's Chief Cabinet Secretary says milk exports from Fukushima prefecture are suspended. But Yukio Edano says "eating the banned food wouldn't pose any immediate risk to human health." The AP reports the U.S. State Department is offering potassium iodide to its workers and their families in Japan. A travel warning says the medicine, which helps protect the thyroid in case of radiation exposure, is being given out of 'an abundance of caution.' Stars and Stripes reports the U.S. military is distributing the pills on Honshu but authorities warn no one should take the medicine until advised to do so. The State Department's full Japan travel warning is here.